They were ardent tellers of tales. As the night passed, they soon arrived at the closing of the ninety-ninth weird story. The room was thick with anticipation. “Let us not be impatient.” said one of the men. “A drink and some food together before the final tale is told.” All in agreement, they produced lacquered boxes packed tight with delicacies. These were shared between the intimate gathering. They sat in a circle, enjoying the brief respite. Without warning, a great hand appeared on the ceiling. It appeared to stretch wide, reaching its fingers out in a colossal grasp. As to the spider, it appeared to be of the variety known as the orb-spinning spider. It would flatter it too much to call it a Joro spider (joroguma). 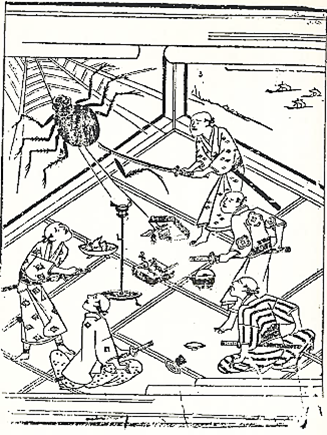 Its color was not right to call it an earth spider (tsuchigumo). But it was no common pit spider either (anagumo). After all, in its web it had killed a giant weevil, so it must have a dreadful poison. But its color was blue/green, like the kind of insect that could disappear between blades of grass. Perhaps it was a sea spider, blown here by an ocean breeze that carried it far from its home, floating in the air as if on the waves. It is pitiable; this spider carried so far from its home, trying to make do in its new environment, spinning a web on unknown surfaces. We should admire its perseverance. It was only sitting there, sleeping in the summer heat, never asking for the intrusion of these storytellers. And here was its fine works undone. Our own fine works are made of individual threads that can be pulled apart. We can be killed on the street walking home, joining Yorimitsu in the spirit realms. Or maybe tomorrow will come. It is not for us to decide. 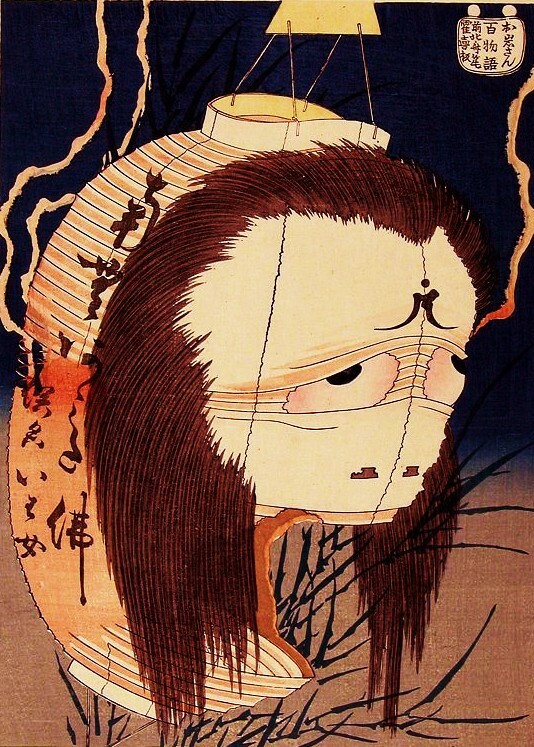 This story comes from the 1660 kaidan-shu Tonoigusa by Ogita Ansei. 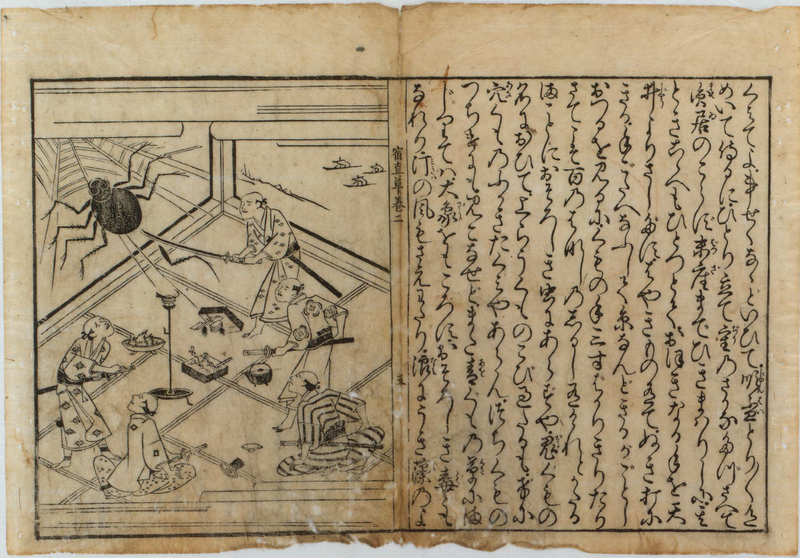 It is one of the earliest known accounts of the game Hyakumonogatari Kaidankai. I’ve read numerous accounts of this story, but had never read it myself until recently. I was surprised to find the epilog about the spider, as it is not included in most translations. Yes, the epilogue raises it up from a common anecdote. Quite fitting.